Secure your baby from the sun's extreme rays with the Kiss My Face Baby's Very first Kiss Cream SPF 50. This super-gentle broad spectrum SPF 50 sun block is instilled with safflower, aloe, and chamomile for hydration and nourishment. 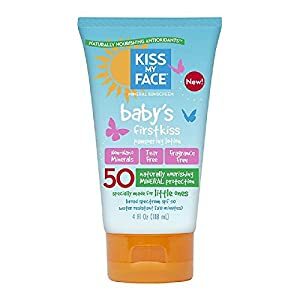 Non-nano mineral defense safeguards infants' delicate skin without making use of parabens, SLS (sodium lauryl sulfate), and fragrances. Plus, it's hypoallergenic and tear-free, as well as water-resistant for 80 minutes, making it terrific for the beach.